Hey y'all! I'm opening a new store in digiland at the beginning of July. Post a comment here with your guess of the store I'm moving to, and you'll be eligible to win one of three prizes ~ $25, $15 and $5 coupons to my new store! Winners will be randomly selected from the comments posted. You do not have answer correctly in order to win. And while I'm super excited to be on this new adventure, my heart is heavy saying goodbye to my fellow digi designers at The Digichick! 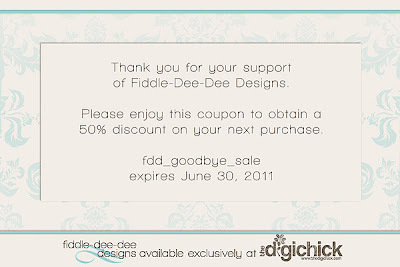 Please use this coupon to enjoy 50% off your next purchase at The Digichick ~ now until June 30, 2011. Some products won't be moving to my new store, so take this opportunity to grab them while you can. Thank you for all your support over the past year-and-a-half ~ and keep watching for my new store announcement! I am going to guess Scrap Orchard. I'm going to guess you're opening at the Sweet Shoppe. Best of luck, wherever you're headed! Love your templates so far! Well, I know where you are going, so I won't guess, but I still would like a chance for a GC to your new store Cheryl! Gonna have to get my FDD fix somewhere! 9th & Bloom? I know they're going to miss you at TDC! I´ll say...Scrap Orchard? Good luck on your new store and thanks for the chance!! I guess your new store is at 9th & Bloom too! Congrats and good luck in your new store. Thanks for the chance...and good luck wherever it is! After 5 Designs? Love your templates, Cheryl. I'm going to go off in a different direction and say ScrapMatters. Good luck! 9th & Bloom or Scrap Orchard!! Good Luck!! Well, I'm gonna cross my fingers for ScrapMatters! I'm gonna guess scrap orchard. Thanks for the chance and good luck! I'm guessing one of my two favorites shops -- Scrap Orchard and 9th & Bloom. I'm hoping it's Scrap Orchard...so that's my guess! Maybe Scrap Orchard? Congrats on the new shop, wherever it might be! 9th & Bloom or Scrap Orchard!